Install eLABSync File Uploader to setup a one-way synchronization of local files on your computer to your eLABJournal account. Files are automatically uploaded from any folder on your local computer to your dashboard to attach them to experiments. Use eLABSync to monitor the folder in which you store all data resulting from experiments or install eLABSync on a computer linked to a device that does overnight measurements to monitor and log data output at home. Start by downloading eLABSync for windows and run the install wizard to install eLABSync on your PC. Note that eLABSync is not yet available for Mac. After installation and launching eLABSync, you first need to authenticate by logging in on the eLABSync application to upload files from your local PC to eLABJournal. Enter your email address and password and click Login to link eLABSync to your account. Please note that your computer requires connection to the internet and you must already have a registered eLABJournal account. 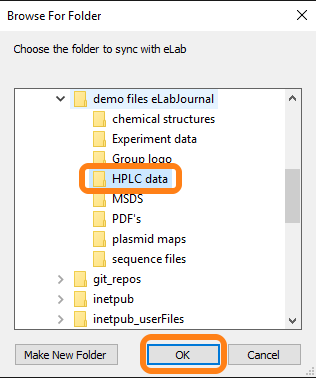 After login, proceed by selecting the folder of which files should be synced to eLABJournal by clicking OK. Note that eLABSync only monitors the files added directly to the selected folder and not files in sub folders. After eLABSync has been configured, the application is added to the system tray of your computer. Click on the eLABSync icon in the system tray to open the application settings. You can quit the application or force a direct sync of the monitored folder or open the settings. In the settings you can logout, change the monitored folder or adjust the minimum files age (i.e. time after adding of the file before the upload starts). Click Manage Authentication at the eLABSync App. Access tokens are like a one-time passwords that are used to authenticate an external application or device. 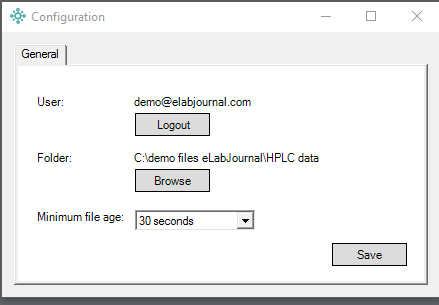 The advantage is that you can remove access tokens at any time to disable an external device or application to connect to your eLABJournal account. Also with the organisation-specific login (in that case the web application does not have any login credentials) access tokens are used to authenticate external devices. Label the access token and click Generate to create the access token. Paste the access token in the eLABSync application after selecting the tab login with token and click Verify to completed authentication. Note that the here generated tokens can also be used for authentication of the Mobile App or the API.